Amy Lukas, left, and Mary Catterlin spent three months paddling around Lake Michigan in a canoe carved out of a cottonwood tree by Catterlin. BEVERLY SHORES, Ind. 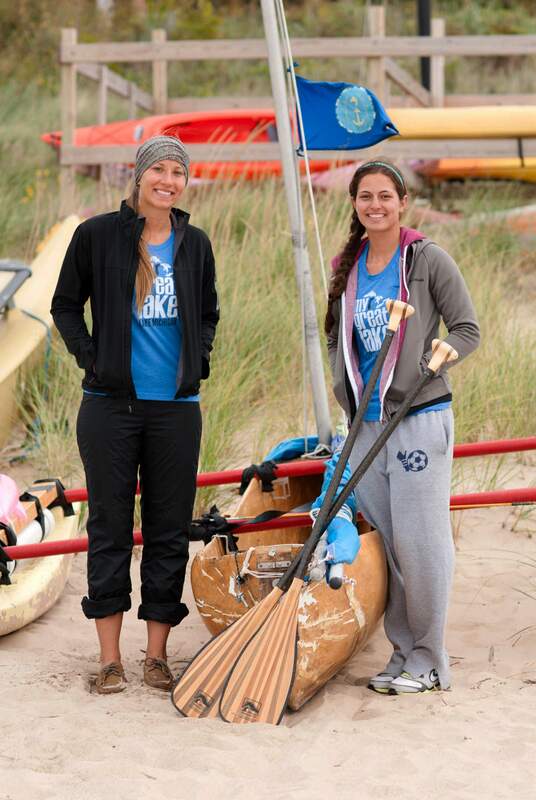 (AP)  Taking a homemade canoe around Lake Michigan started out as a joke but became reality when two local women pulled onshore Monday night after being gone for three months. Amy Lukas and Mary Catterlin began joking about taking a trip around the lake when they were in high school but seriously began planning a trip as Catterlin handcrafted a canoe in her backyard. Catterlin, 23, of Michigan City, spent about 3½ years carving the boat from a cottonwood tree. I was making it because I couldnt afford one and wanted one, she said. The women launched off from Broadway Beach in Beverly Shores on July 1 and traveled around the lake camping and staying with family and friends along the way. Lukas, 24, of Beverly Shores, said the best part about the trip was meeting all the people who supported and helped them. They averaged about eight hours a day paddling and updated family and friends through a blog. Catterlins mother, Betty, kept up with her daughter by meeting with her at several points along the way. I knew there wasnt going to be any stopping her, so I supported her, she said. Betty Catterlin, 60, of Trail Creek, knew the trip had been well planned and thought out. Both women wore life jackets with GPS devices attached to them. They also had an emergency distress signal in case something went wrong, Catterlin said. Theyre not just adventurous, theyre smart, she said. For more information about hunting in Colorado, visit Parks and Wildlifes online hunting section at http://wildlife.state.co.us/HUNTING/Pages/Hunting.aspx.